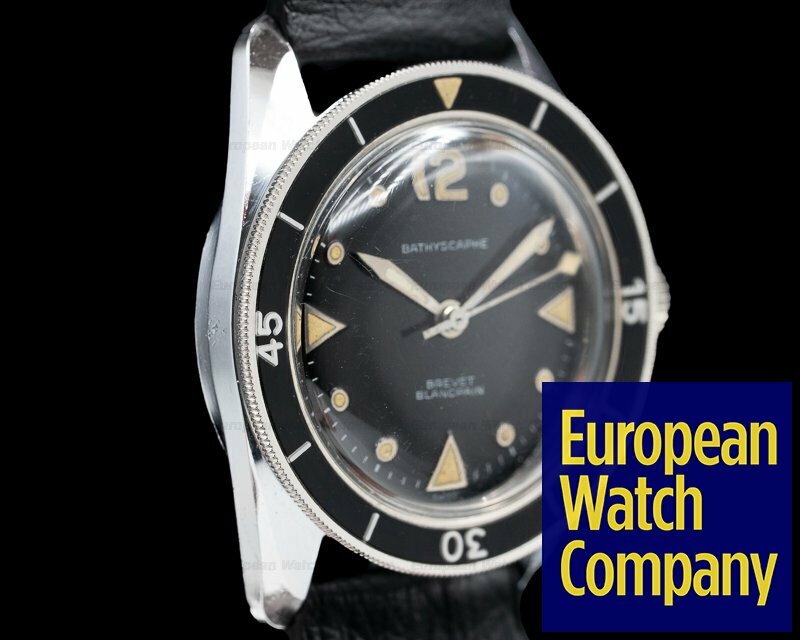 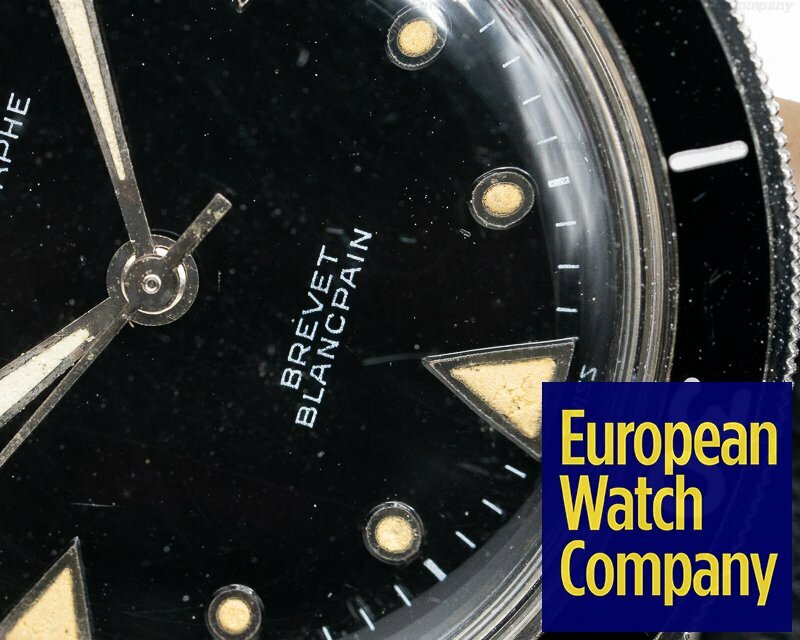 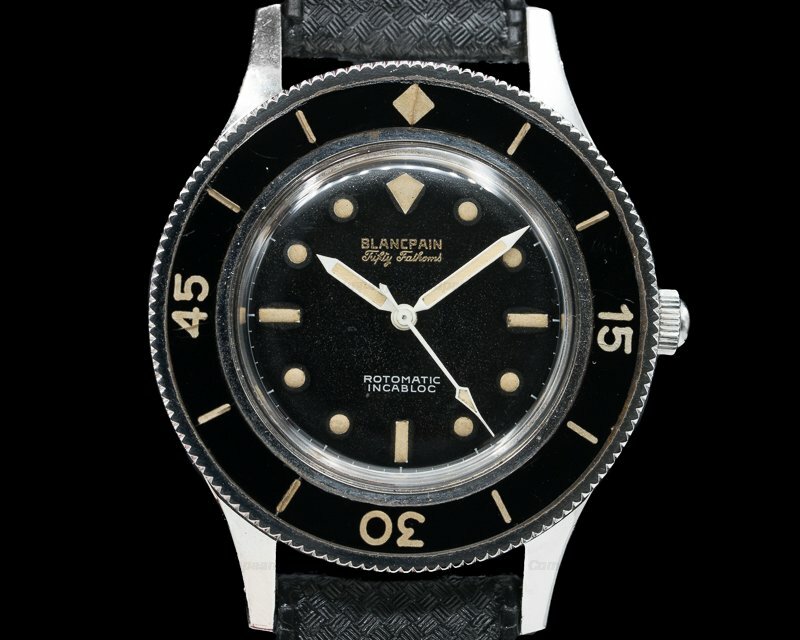 30306 Blancpain Bathyscaphe Aqualung Vintage MC4, stainless steel case on a strap, sharp case with original lines, manual wind movement, caliber 1187/94, original tritium dial and hands with matching patina, glossy black dial, bi-directional bakelite bezel, circa 1960s, diameter: 34mm, thickness: 12.2mm. 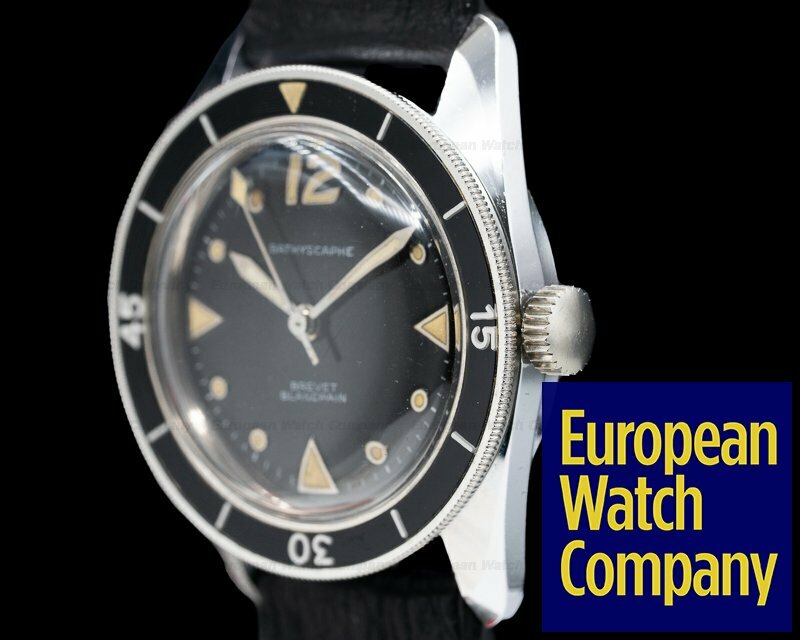 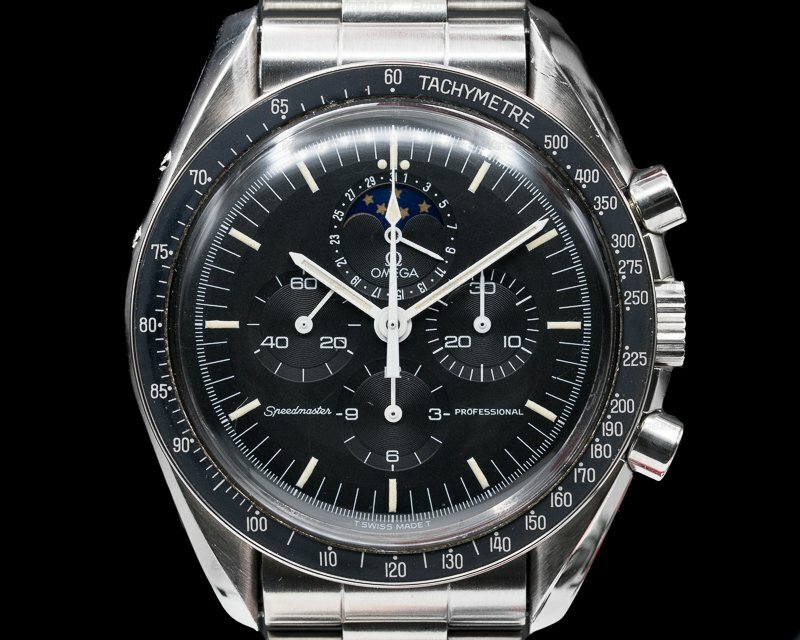 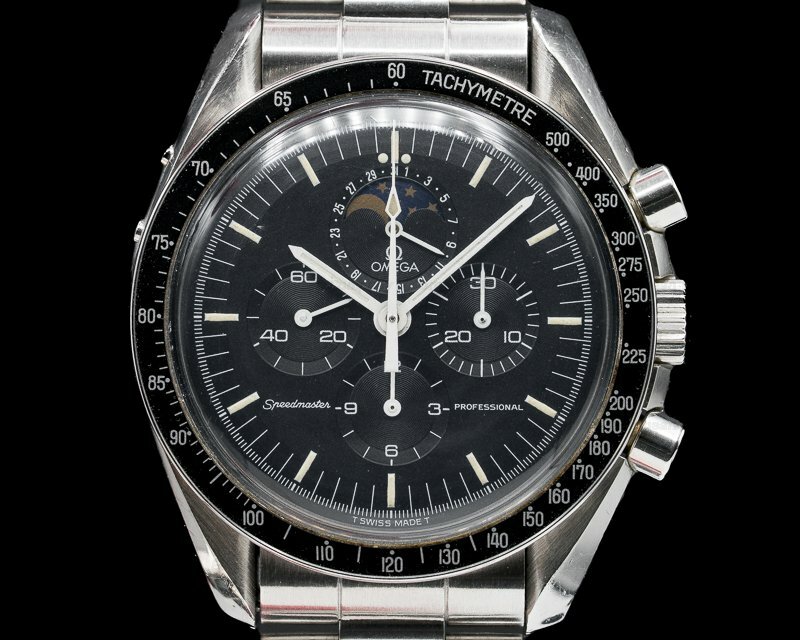 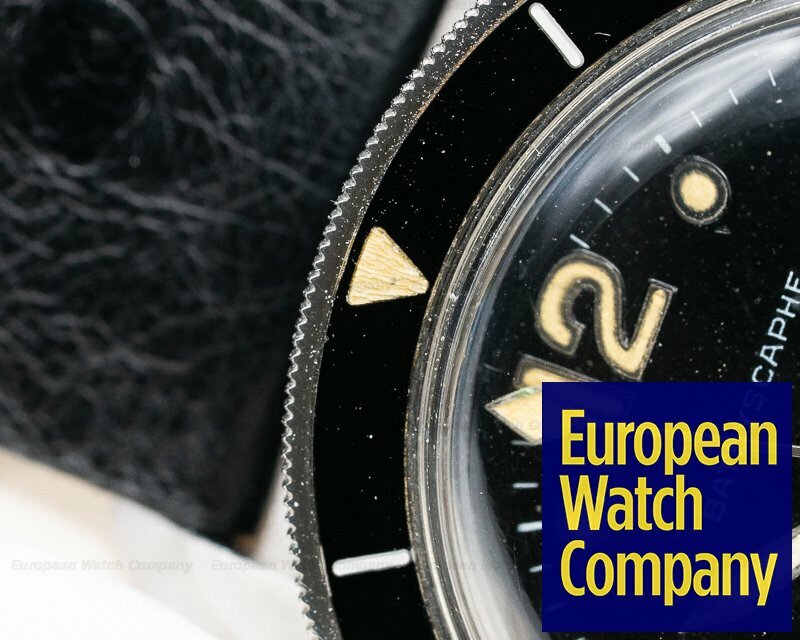 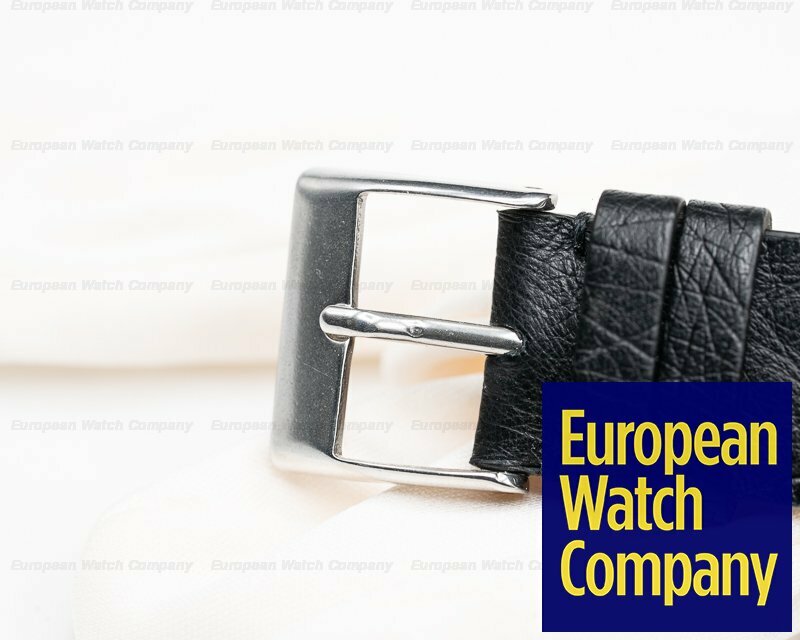 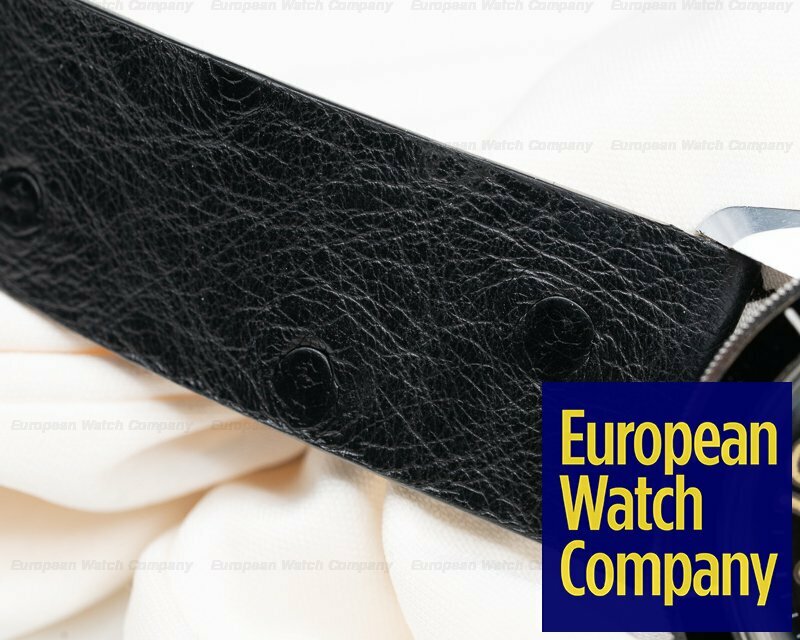 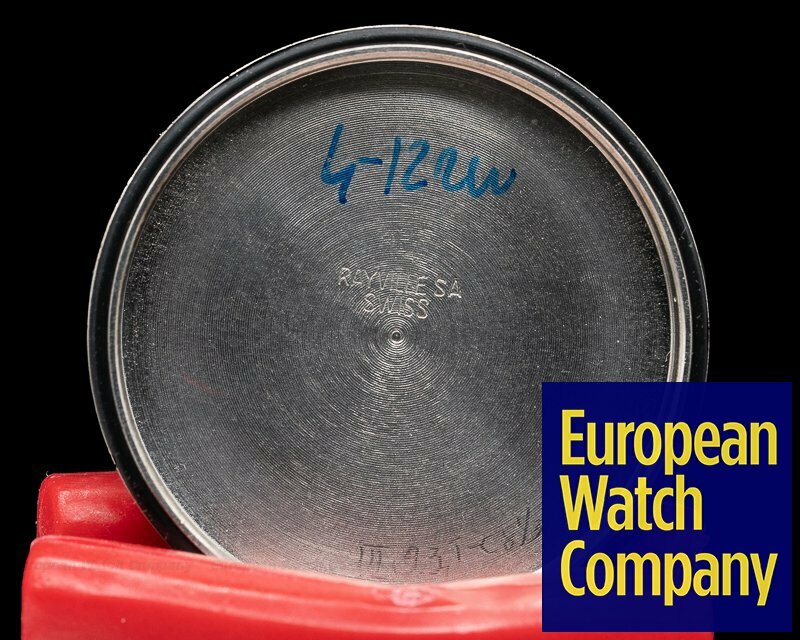 Rare Example in Excellent Condition and comes with European Watch Company pouch and 6-month warranty. 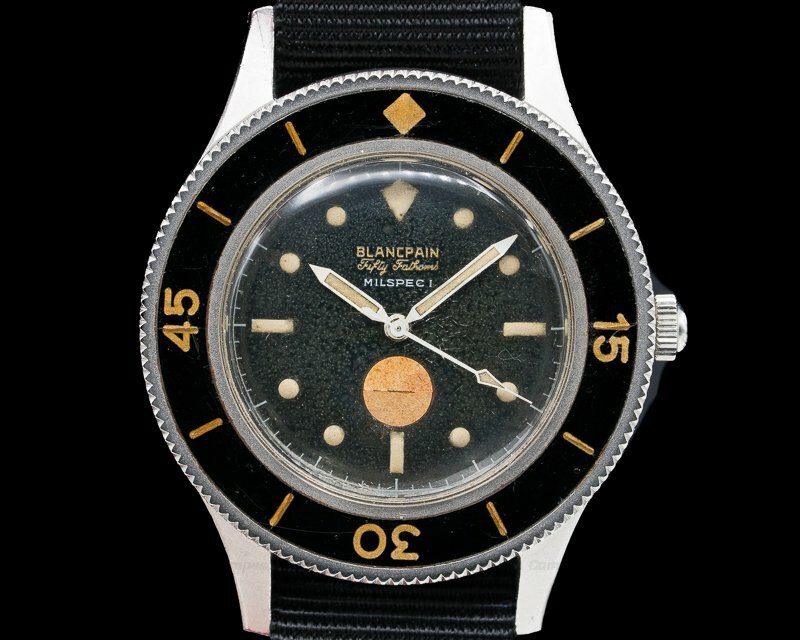 This is a vintage c. 1960's nickel/stainless steel Blancpain Bathyscaphe Aqualung, MC4. 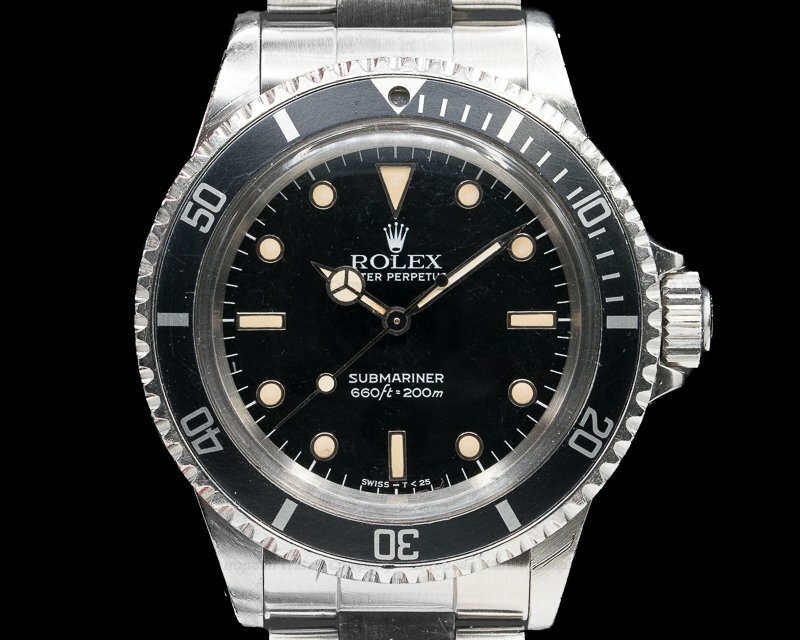 It has a leather strap with a stainless tang buckle, and an acrylic crystal. 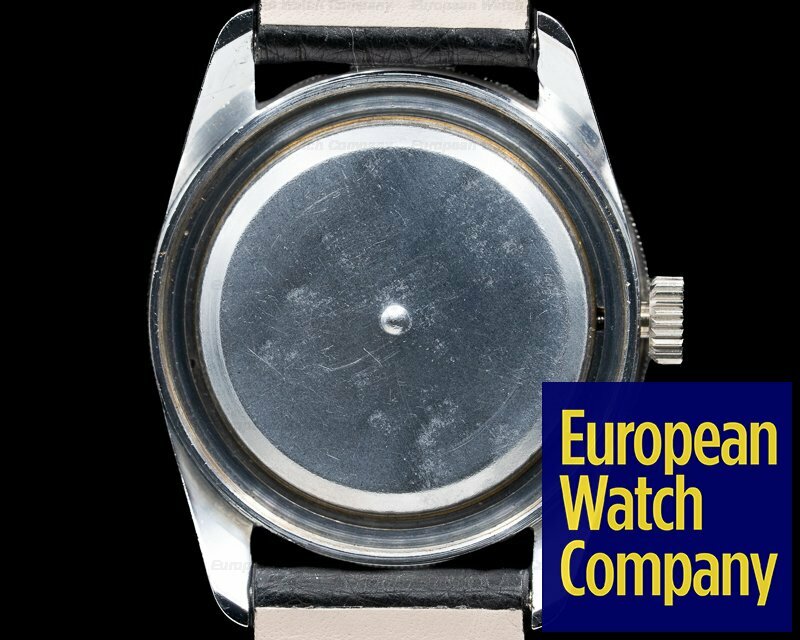 It has a screw-down solid case back engraved “Antimagnetic, Waterproof, Shock-protected,” and a screw-down winding crown, as well as a dust cover for anti-magnetic protection for the movement. 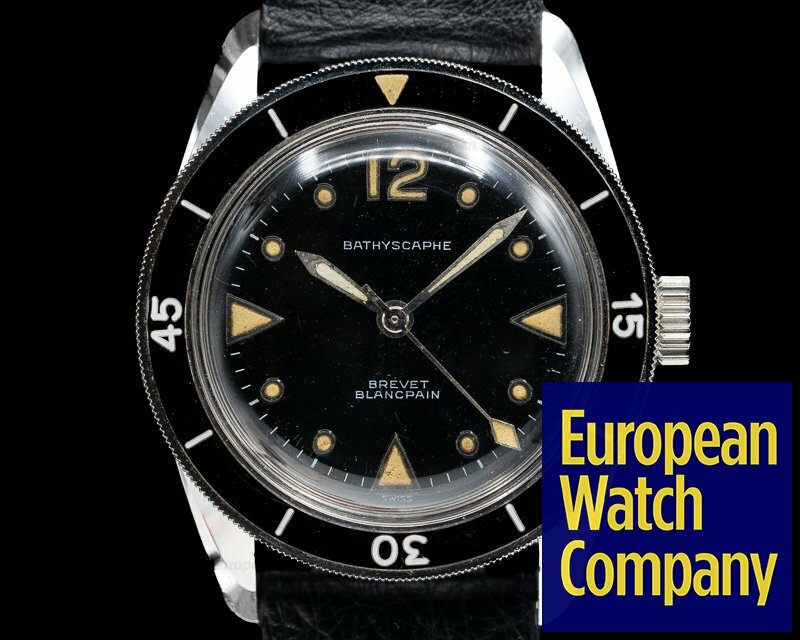 The 34mm diameter solid three-body case, downturned lugs, and bi-directional bezel with a black Bakelite insert are polished/brushed. 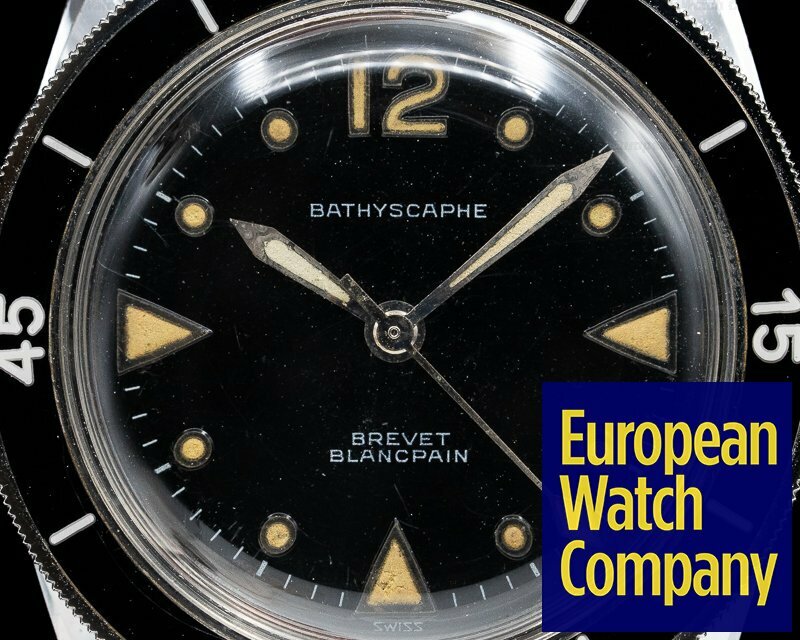 The original dial is glossy black with applied luminous triangle and dot hour markers, an Arabic numeral 12, and luminous spade hands with a center sweep second hand. 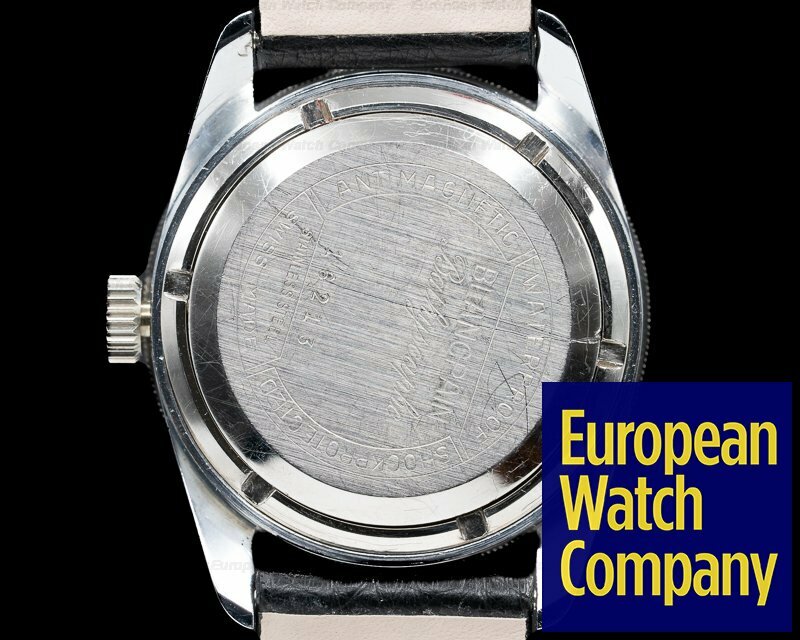 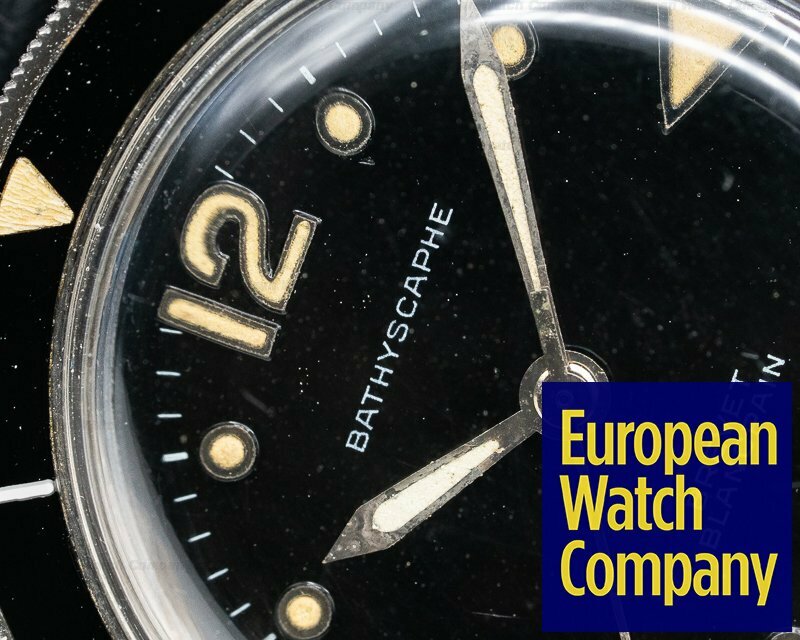 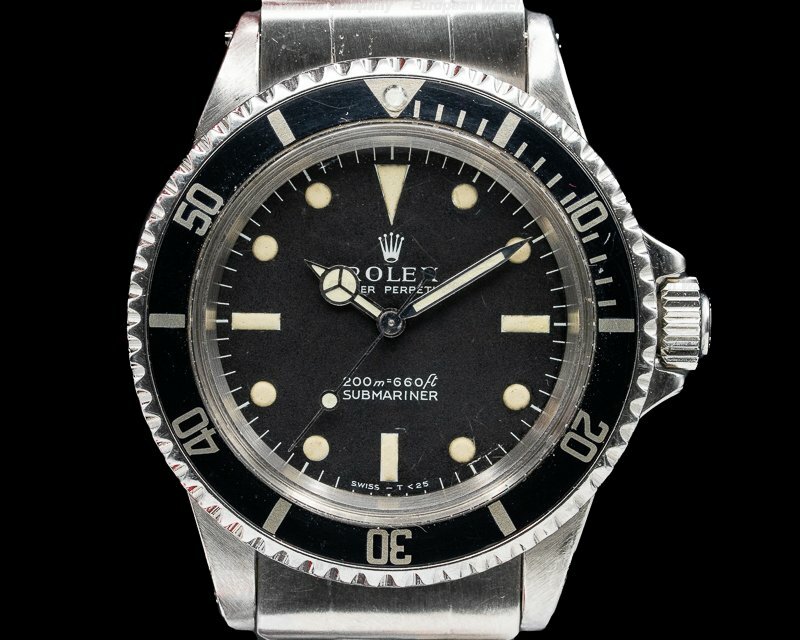 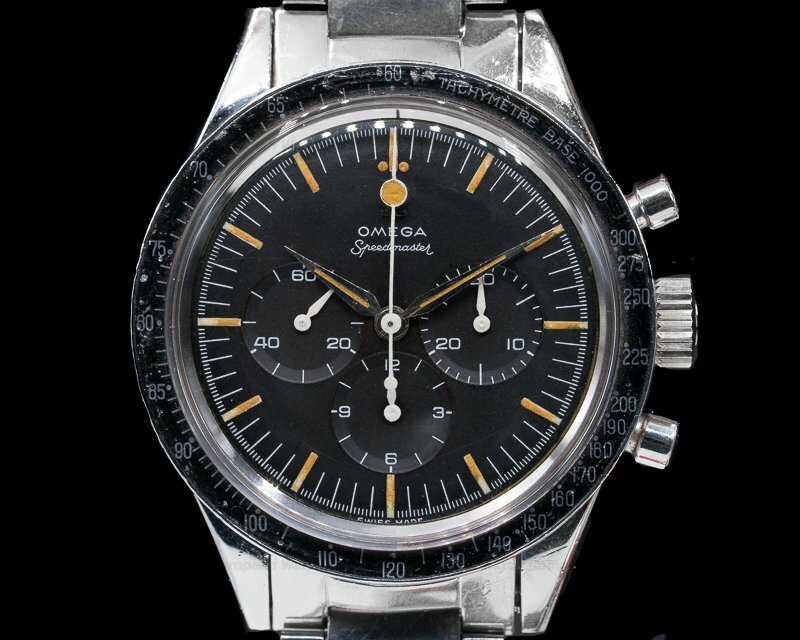 There is an outer minute/second track and the Bakelite bezel insert has white Arabic numerals at the quarter-hour intervals. 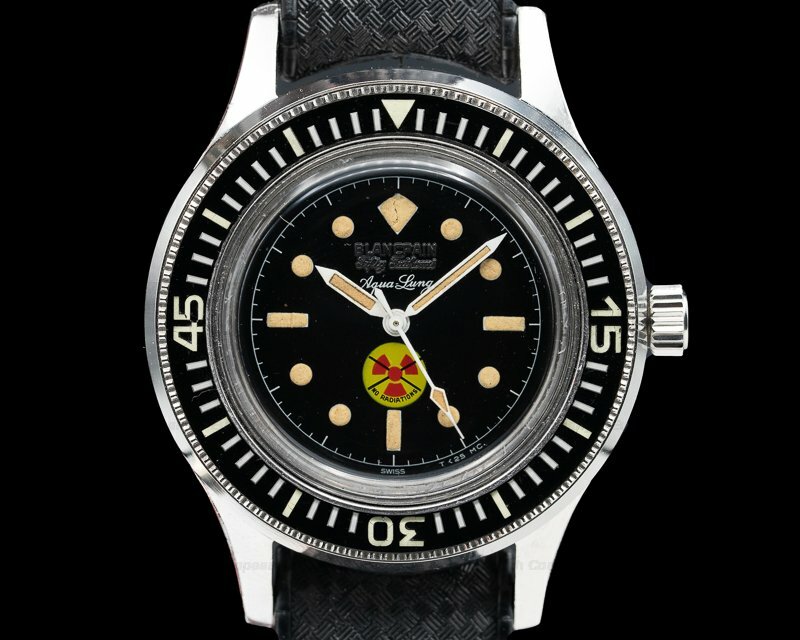 It's water resistant to 60 meters/130 feet, and the 12.2mm thick case, dial, and movement are all signed. 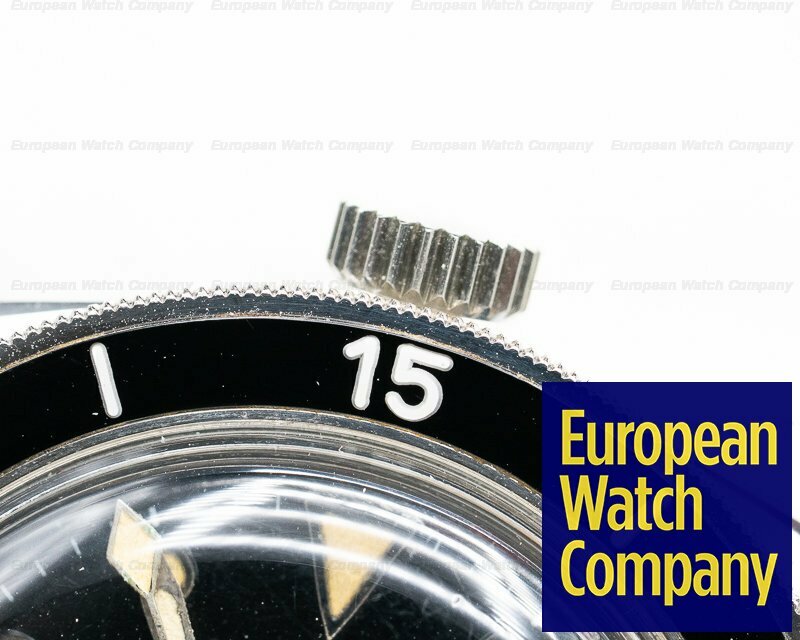 The mechanical manual winding Rayville caliber AS 1187/94 movement (discontinued in 1967) has a straight-line lever escapement, a shock absorber mechanism, and a monometallic balance that's adjusted for temperature and 5 positions. 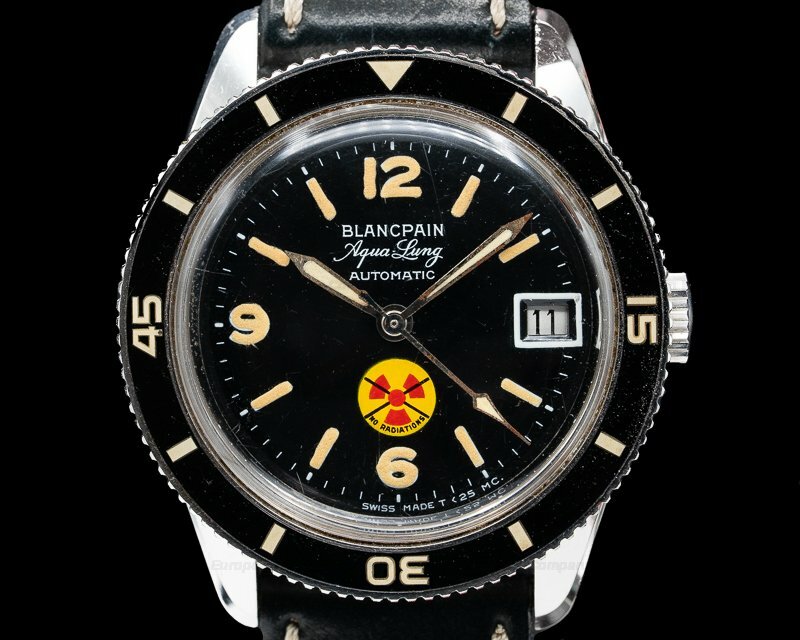 The Blancpain Bathyscaphe MC4 is a diving watch from the early-to-mid 60's, a time of pioneering deep-sea exploits that went deeper than any scuba diver or even submarine could venture. 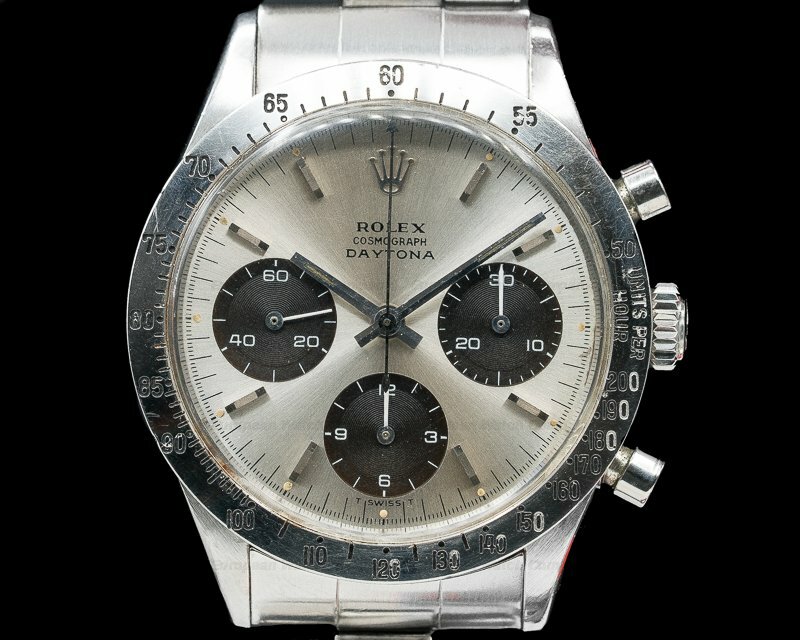 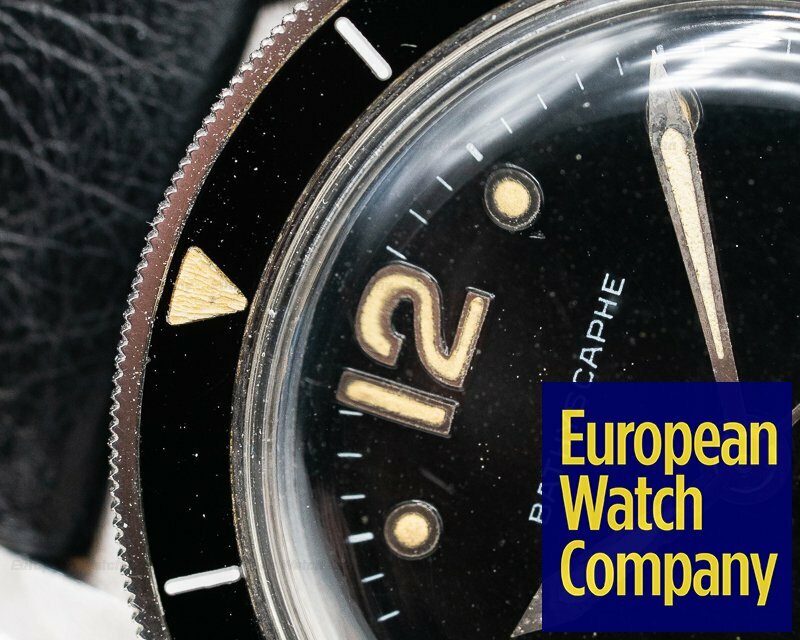 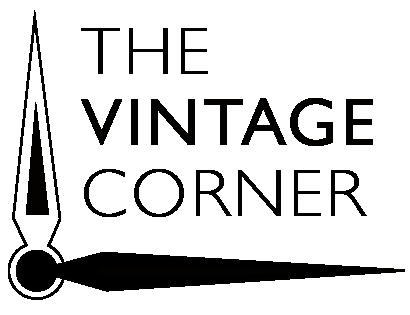 This watch debuted in 1959 with the caliber AS 1187 manual winding movement.